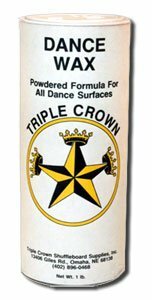 Perfect for wooden or finished dance floors, this product resists finish marring. It is a yellow, powdered waxing formulation. 15 oz shaker container. "An exceptional product that will not cake or clog. Will give a slippery hard finish to all floors. Clean, dustless and will not soil garments or shoes. Has large covering capacity and long wearing qualities. Can be used on damp floors and in open air pavilions." Directions NOTE: Sprinkle lightly over floor. Brush wax over dancing area with push broom; then sweep off excess wax. 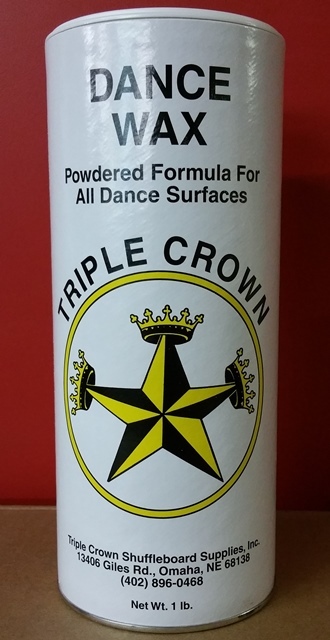 Use sparingly and test product on dancing surface. Check floor periodically to avoid excessive wax build-up.